The VTE and VTV are the Computer Based Training solution integrating 3D interactive graphics and to the European Space Agency (ESA). This innovative new solution will allow the ESA European Astronaut Corps (EAC) to enrich its space-crew training materials with 3D interactive simulations. The training simulations developed using the ParallelGraphics software will be used for on-ground training as well as just-in-time training on-orbit at the International Space Station (ISS). 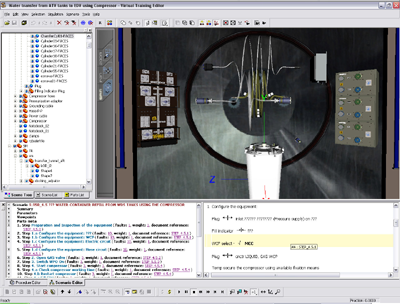 The core element of the solution is the Virtual Training Editor. The training and mission operations are of crucial importance to the ISS and other manned programs like Mars mission. To support this objective, ESA has chosen the ParallelGraphics Virtual Manuals technology to include 3D graphics for both on-ground training and on-board astronaut refresh training. Research has shown that the 3D component will bring benefits to the task of training, such as minimizing the time required to train for a task, increasing knowledge retention and providing new insight into the operation of complex machinery or systems. Today’s Computer Based Training has the capability to improve the quality and performance of new generation space-crews training. The Virtual Training Editor (VTE) is a powerful authoring tool for building 3D-powered CBTs. The data is imported from a CAD system to the 3D Simulation Production System (3DSPS), refined, and made available for manual editing. On the basis of this data and text based instructions from corresponding technical manuals, the author uses the VTE to create animations. Once the work on the 3D simulation is completed, the MMR version of VTE stores information representing the 3D environment in a database for publishing in training applications and technical documentation. With VTE, the user can easily produce SCORM-compliant multi-mode training application by combining 3D simulation and existing training documentation in standardized formats. The first expedition crew involved in the Automatic Transfer Vehicle (ATV) attached phase operations will benefit from the new generation training developed using ParallelGraphics Virtual Manuals. Astronauts will be able to refresh on-board the system procedures of the Integrated Cargo Carrier (ICC) just before executing them with the real hardware. Once the virtual procedure is created, the Virtual Training Viewer (VTV) allows the execution of the virtual training procedures and the scoring of the student execution results. The VTV allows execution in Learn, Study, and Exam modes.